During an asked and answered session today, Rockstar spilled on some more GTA 5 details, and there were plenty of interesting tidbits to take away. Firstly, we got some facts on just how big the game will be. For Xbox 360 users, the initial install will require 8GB of space minimum on either the hard drive or an external 16GB USB flash drive. As for the PS3, the game will install as soon as it's put into the console, also taking up "roughly 8GB". It won't be taking advantage of Sony's new 'play while downloading' feature, though for a game of this caliber we're not too surprised. 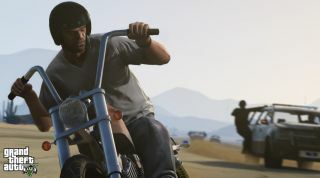 "Grand Theft Auto V is the largest and most ambitious game we have yet created, and takes full advantage of every ounce of processing power available in the current generation of consoles," said Rockstar, for anyone doubting just how big Los Santos will be. We want Grand Theft More-to! So that's all well and good for the current-gen consoles, but what about the Xbox One and PS4? Well, Rockstar's keeping tight-lipped about that for now. "We don't have anything to share about the possibility of a next-gen or a PC platform release at this time and we are completely focused on delivering the best possible experience for the consoles people have right now," it said. It did confirm, however, that the GTV 5 multiplayer experience will be called Grand Theft Auto, while some general gameplay footage will be appearing "soon". We were particularly interested to read how switching between the game's three playable protagonists, Michael, Franklin and Trevor, would work. "Because they have their own schedules, you'll never know what they might be doing – you might drop in on Michael in the middle of a family dispute, interrupt Franklin chatting up some ladies, or Tervor on the run from the law." Hungry to see more? So are we. Luckily Rockstar promised that there will be no more delays, so we can expect it to stay true to that September 17 release date.